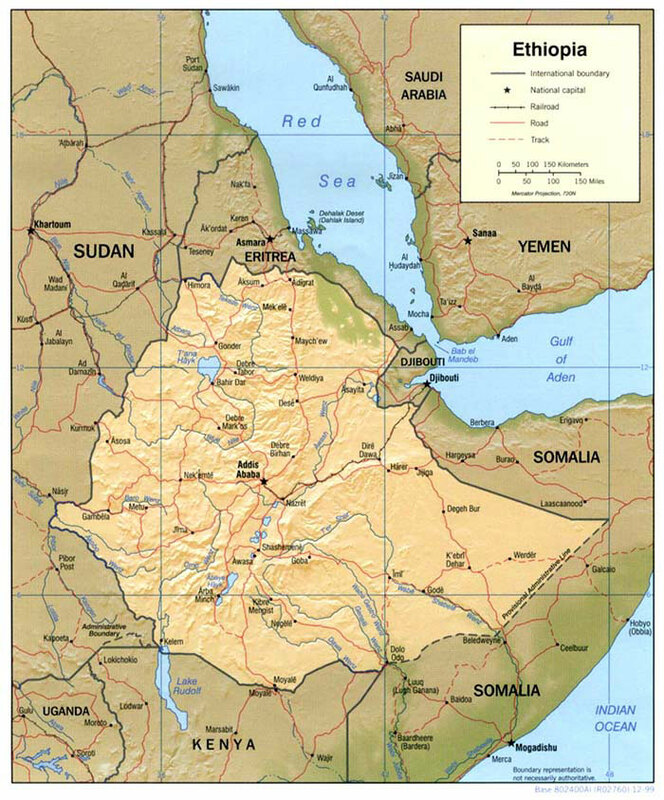 Ethiopia is often equated with the entire Horn of Africa, although there are several independent countries: Eritrea, Ethiopia, Djibouti and Somalia. The country is located on the the easternmost projection of Africa and is considered to be the heir of the great Kingdom of Aksum. Along with the official name of Ethiopia that derived from the Greek word for 'people with faces, burnt by the sun', the country has another name - Abyssinia, under which it is known among the Muslim and European nations. It goes back to the ethnonym Habash(m) that means a local tribe or confederacy of tribes, and was first met in South Arabian inscriptions of the 3th century BC. Ethiopia is a unique historical and cultural region of the African continent, as it has preserved its own ancient written tradition. This is due to the fact that it is one of the first on the planet to adopt Christianity as a state religion. Its Church is on a par with the oldest Eastern Churches such as Armenian, Syrian and Coptic. Christianity came to this country under King Ezana and his successors in the mid-4th – early 6th centuries together with Syrian merchants and missionaries. Until 1959, the Ethiopian Church was part of the Coptic Church, its metropolitans were appointed by Patriarches of Alexandria and were sent to this East African country from Egypt. Since the adoption of Christianity, there was a problem of the translation of the Bible into the vernacular language – Ge'ez, or classical Ethiopic, belonging to the Northern branch of the Afro-Asiatic family. The modern official language of Ethiopia - Amharic that became of the language of the military-political elite by the 13th century, belongs to the Southern branch of the Afro-Asiatic family. Ge'ez, apparently, ceased to be spoken at the time of the decline of the Axumite Kingdom in the 8th-10th centuries. But it was the only literary language until the 19th century. Now, Ge'ez is the liturgical language of the Ethiopian Orthodox Church, in which church services are conducted. Thus, the texts in Ge'ez were understood only to a limited circle of people involved in church service or received a traditional education. Similar to the South Arabian one, a consonant-only alphabet that was used to write Ge'ez in Ethiopia for centuries, evolved into a syllable alphabet representing vowel sounds by adding vocalic diacritics to the consonantal letters. Such alphabet accurately transmit the pronunciation of foreign words. The Ethiopian syllabary, in its original version, consisted of 275 characters, in addition to special characters and punctuation marks. The first books in Ethiopia were translations of the Scriptures, both Old and New Testaments, quotations of which are found in the monumental inscriptions of the Axumite kings, liturgical writings, sermons. That is why, the Ethiopians associated texts of this kind with the notion of the book. The phrase "holy book" (metshaf kydus) meant the Bible, but the word "holy" could be dropped from it without changing the meaning, so the word "book" (metshaf) had the same meaning. An arabic term for a bound book (mushaf) was borrowed from Ethiopian, which is not surprising: the early Islamic community contact with Ethiopia closly and used the Ethiopian word for the Quran sheets. A number of biblical apocrypha and early Christian texts have come down to us only in translations into the Ge'ez language, thanks to centuries of isolation of the country from the outside world and the conservatism of its scribes. Ethiopian scribes were brought up by the traditional system of education, which was the only form of education in this country until the early 20th century. It was only ecclesiastic and included several stages which a student could study for up to 30 years. Ethiopian manuscripts (whether royal chronicles, monastic chronographs or lives of the saints) astonish at erudition of their authors in Scripture and the writings of the early Church Fathers. Scribes' works reveal their perfect education and knowledge in combination with skills which, in many ways, formed the features of Ethiopian manuscripts, determined people's attitude to the book, its repertoire, and even some of the unique features of Ethiopian medieval texts. Modern map of the Horn of Africa. 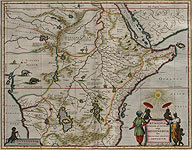 Historical map of Ethiopia from Joan Blaeu's atlas. 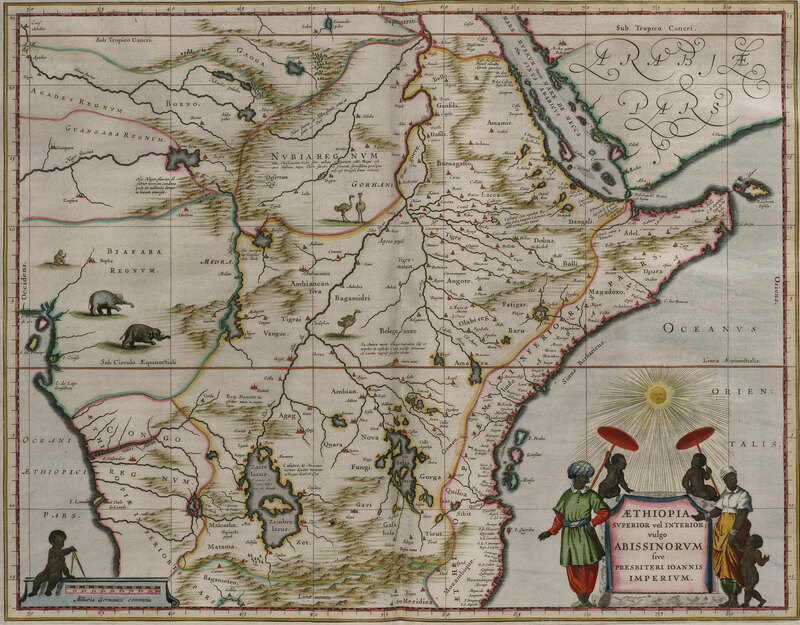 Æthiopia superior vel interior, vulgo Abissinorum sive Prebiter Ioannis Imperium // Africa, quæ est Geographiæ Blavianæ pars tertia, liber unus. Amstelædami: Labor et Sumptibus Ioannis Blaeu, 1662. Между с. 85 and 86. Ill. 3. Dorn 612. Fol. 25. A sample of the Ethiopian writing. Traditional ornaments on fields and between columns of text resemble Coptic illuminated crosses borrowed from the Greco-Byzantine tradition. Ill. 5. Dorn 612. Fols. 124v-125. Four Gospels. 1426. Miniature depicts Apostle John. Ill. 6. Dorn 609. Fols. 128v-129. Psalms with supplements (antiphons and the book of prayer). 15th cent. From the collection of P. Dubrovsky. Ill. 7. Dorn 609. Fols. 197v-198. Psalter with supplements (antiphons and the book of prayer). 15th cent. In the last pages, after the main text, there are written various prayers and two religious qune verses in sloppy handwriting. Ill. 8. Eaf. n. s. 3. Fols. 2v-3. Psalter with miniature head pieces. 18th-19th cents. From the collection of C. Tischendorf. Ill. 9. Eaf. n. s. 19. Binding of wooden boards, enclosed in a cover of the cotton fabric. A double leather case-bag was used for storage. A strip of cloth was sewn to the lower end of the spine to protect the book edge. Ill. 10. Eaf. n. s. 19. Fol. 5v-6. 11th Psalm and the beginning of the 12th Psalm. Miniature head piece is made at a later time. Ill. 11. Eaf. n. s. 13 Fol. 21v-22. From the collection of Chief of Jerusalem Mission Bishop Porfiry Uspensky. Psalms 31 and 32. A number of a psalm, the second line of each psalm and the word "Lord" is written in red ink. Ill. 12. Eaf. n. s. 16. Fol. 1. Psalter. 18th cent. Contains Psalms 1-103. Initial parchment sheets were replaced by paper. The first page is decorated with decals. Ill. 13. Eaf. n. s. 16. Fol. 3v-4. Psalter. 18th cent. Contains Psalms 1-103. On the left side of a double-page spread is a new sheet of paper, on the right is the original parchment. Ill. 14. Eaf. n. s. 1. Fol. 41v-42. Psalter with supplements («Praise and Tenderness» to the Mother of God, the Exaltation to Saint George the Great Martyr). 18th cent. Psalms 41-43. Miniature ornamental head piece containing anthropomorphic elements. Ill. 15. Эф. н. с. 1. Fol. 89v-90. End of the Psalms and the beginning of the «Songs of the Prophets». Between the lines - the traditional system of musical signs (for the performance of hymns during the service). Ill. 16. SPbDA B III/9. Fol. 1v-2. where he was in the Red Cross group. On the left side is a miniature of St. George on horseback, killing the dragon. On the right side is an image of the Virgin Mary with Child, traditional for the Ethiopian iconography. Ill. 17. Dorn 610. Fol. 36v-37. Miscellany. Contains the Song of Solomon, Psalm 118, Praise to Virgin (not completely) and so on. 15th cent. From the collection of P. Dubrovsky. The beginning of the «Praise to Virgin» (for Sunday) with several religious additions (prayers) in the margin. Ill. 18. Eaf. n. s. 22.
give as a gift to Nicholas II by the Ethiopian embassy. The manuscript is enclosed in a sack made of silk in colours of the rainbow outside. Ill. 19. Eaf. n. s. 22. Bag-Case. used to wear the book over the shoulder or to hung on the wall inside the house or in the church library. (thr Ethiopias normally keep books in this way). Ill. 20. Eaf. n. s. 22. Fol. 4v-5. in the best traditions of Ethiopian book art. Ill. 21. Eaf. n. s. 22. Four Gospels. 1895. An impression of the seal Emperor of Ethiopia Menelik II. Ill. 23. SPbDA B III/13. Fol. 3v-4. where he was in the Red Cross group. An unpainted miniature before the beginning of the text depicts the Apostle John writing the Holy Gospel. Ill. 24	SPbDA B II/39. Fol. 8v-9. Gospel of John, divided into days of the week with supplements (Liturgy of the Virgin, Wonders of the Virgin and so on.). 19th cent., Harar. The manuscript was given to Archimandrite Efrem as a gift in 1895, the first Russian priest in Abyssinia, and was donated by him to the library of the St. Petersburg Theological Academy in 1905. An ornamental head-piece decorates the first lines of the gospel. In the fields, days of the week are written in red, in which the relevant passages of the text are supposed to be read. Ill. 25	SPbDA B II/39. Сумка. Gospel of John, divided into days of the week with supplements (Liturgy of the Virgin, Wonders of the Virgin and so on.). 19th cent., Harar. The Gospel is kept in a traditional double case-bag with a belt. The binding is made of embossed red leather. Ill. 26	Dorn 613 Fol. 1. Gospel of Johnа. 15th cent. From the collection of P. Dubrovsky. Before the beginning of the text, there is a multicoloured head piece. A coloured picture of Apostle John (traditionally placed in front of the respective Gospel) is cut off. Ill. 27	SPbDA B III/16. Fol. 4v-5. where he was in the Red Cross group. On the right sheet is a miniature showing John the Baptist with the lamb. On the left folio is the beginning of the «Prayer of Peter, Supreme Apostle of Him…». It was exhibited at the "Abyssinian sanitary and ethnographic exhibition" of the Red Cross in St. Petersburg in 1897«Молитва Петра, верховного Apostleов Его…». Four Gospels. 18th cent. The first four pages carry beautiful miniatures in full sheet. The miniatures are not fully painted. On the left side is a miniature depicting the Archangel with a sword. On the right is the Virgin Mary with Child. Ill. 29	SPbDA B III/6. Binding. Traditional Abyssinian binding is made of embossed brown leather. Ill. 30	SPbDA – B III/12. Fol. 21v-22. The music liturgical book contains verses from the Psalms. 18th-19th cents. where he was in the Red Cross group. A multicoloured head piece is at the bottom of the page (text delimiter). Between the lines is the traditional system of notation (for the performance of hymns during the service). Ill. 31	Eaf. n. s. 25. Fol. 86v-87. Miracles of the Holy Trinity. 19th cent. The manuscript was acquired by the Library in 2006. It contains multicoloured miniature head pieces. Ill. 32	Eaf. n. s. 25. Fol. 105v-106. Miracles of the Holy Trinity. 19th cent. The manuscript contains multicoloured miniature head pieces. Parchment scroll (the most common type of Ethiopian protective amulets). 19th cent. Ill. 34	СПбДА, Б III/19. At the top of the scroll there is an Ethiopian trditional multicoloured cross. During the Muslim invasions of the 14th and 15th centuries, Ethiopians began to hide their affiliation with Christianity. Consequently, crosses were modified beyond recognition. Ill. 35	Eaf. n. s. 29. Protective amulets in the form of small pleats (one of the varieties of amulets). Late 19th – early 20 cents. It contains magic prayers and miniature head pieces. Ill. 36	Eaf. n. s. 28. Parchment scroll (the most common form of protective amulets in Ethiopia). Late 19th – early 20th cents. Contains prayers and the legend of St. Sisinios' struggle against the witch Werzelya. The scroll includes three miniatures. The second is "Grid to Catch the Devil." According to traditional beliefs, after looking at this picture, the demon possessing the person, will enter the "grid" and will not be able to get out of it. Ill. 37	Eaf. n. s. 28. Magic scroll. Late 19th – early 20th cents. The final miniature shows an angel with a sword, killing the demon. Ill. 38	Eaf. n. s. 11. Fol. 39v-40. This grammatical and lexical work was made for the personal use of Peter, Patriarch of Alexandria (Peter VII; 1809-1852).